When using a charcoal grill, getting the fire going isn't the hard part. You need to pay attention to safety since lighter fluid is one of the top causes of grilling-related injuries. Learn about alternatives and how to light your charcoal safely with or without lighter fluid. The best way to start your charcoal is with a charcoal chimney or similar device. A charcoal chimney uses newspaper instead of lighter fluid, eliminating the use of a petroleum product that can add unwanted flavor and residue to your food. You place a couple of sheets of crumpled newspaper in the bottom of the chimney and charcoal on top of it. Light it and the charcoal will be ready to add to your grill in about 10 minutes. Another option is an electric charcoal fire starter. You place it on your grill with the charcoal and it provides enough heat to get the charcoal going. Now you can remove the electric loop and let the coals come up to temperature. Either of these options allows your coals to burn to a complete ashy surface before you start cooking, ensuring that any glues or additives have been burned off. It's best not to buy self-lighting charcoal as it has additives that act as a lighter fluid. These can add off-tastes and chemicals to your food if they aren't burnt off completely. Make sure you have read your charcoal grill's instructions and that you understand them. Cleaning the grill before each use reduces the kind of smoke that can leave a bad taste on foods. Always thoroughly clean out the grill, removing ash and grease. Determine how much charcoal you are going to need. You will need one layer of burgers and steaks or two layers for roasts and whole chickens. You need to allow time for charcoal to light and build up the heat. You will need to allow about 20 minutes before you can begin to cook your food. Pour enough charcoal into the grill to make the layers needed. Stack the charcoal into a cone or pyramid shape. Pour lighter fluid over the charcoal cone, using more in the center than around the edges. Use about 1/4 cup of fluid for each pound of charcoal. Let the fluid sit on the coals for about 30 seconds. With a long match, light the charcoal from the bottom on at least two sides. Let coals burn until all coals are white on the surface. 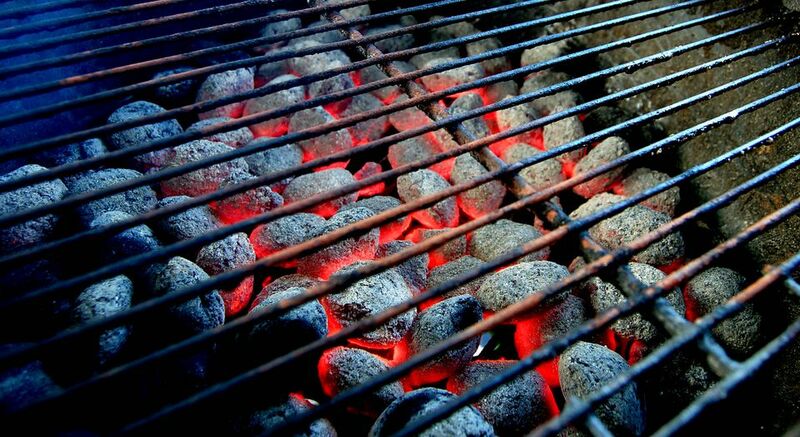 With a long-handled instrument, spread the coals evenly across the coal grate. Close the lid and wait five minutes. Open the lid, replace the cooking grate, add the food and start cooking. Never add lighter fluid to burning coals. Even if there is no flame, the heat will vaporize the lighter fluid and can cause a serious flare up the second the vapor encounters a flame. You can singe your eyebrows and sustain burns. Charcoal should never be added to a gas grill. If you've run out of gas, this isn't an option. You'll need to locate a charcoal grill or restock gas. How do You Really Spell 'Barbecue'?